New one-piece flexplates from TCI offer heavy-duty strength with less weight for high-RPM GM LT1 and LT4 applications. 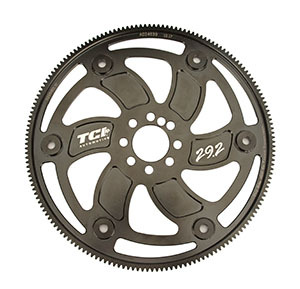 Available in standard and lightweight versions, the TCI SFI 29.2-certified flexplates are made from 4140 forged steel and feature a hobbed-on ring gear and robotic tig-welded converter spacers. Gas nitriding provides for extra surface hardness and strength, while E-coating offers corrosion protection. CNC-milled pockets and lightening holes reduce the flexplate’s rotating mass and drop overall weight — to 6.09 pounds for the lightweight version and 7.6 pounds for standard. Built to withstand 12,000-plus RPM, the flexplates are heavy-duty OEM replacements that accept six-bolt LT1 and LT4 converters.